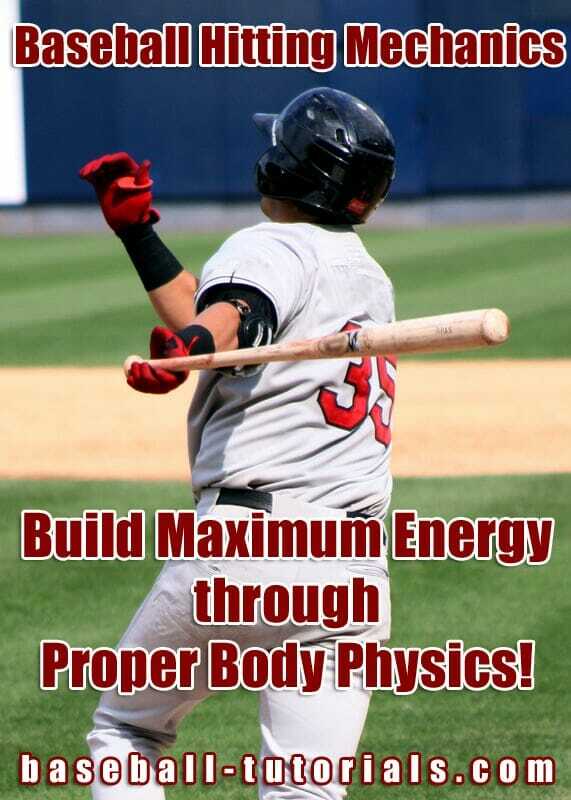 Baseball Hitting Mechanics - Maximum Energy through Body Physics! 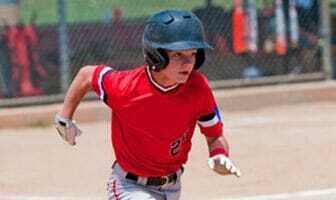 Baseball Hitting Mechanics – Maximum Energy through Body Physics! 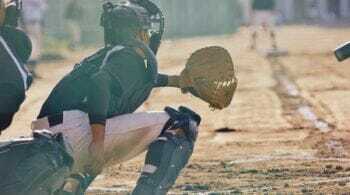 Home » Baseball Drills » Baseball Hitting Drills » Baseball Hitting Mechanics – Maximum Energy through Body Physics! In today’s blog post, we are going to talk in a little bit more detail about baseball hitting mechanics, the swing and building maximum energy through proper body physics, which will result in a more powerful swing and hit. In this article, we talk about the tap movement, timing, posture stabilization and the axis of rotation. 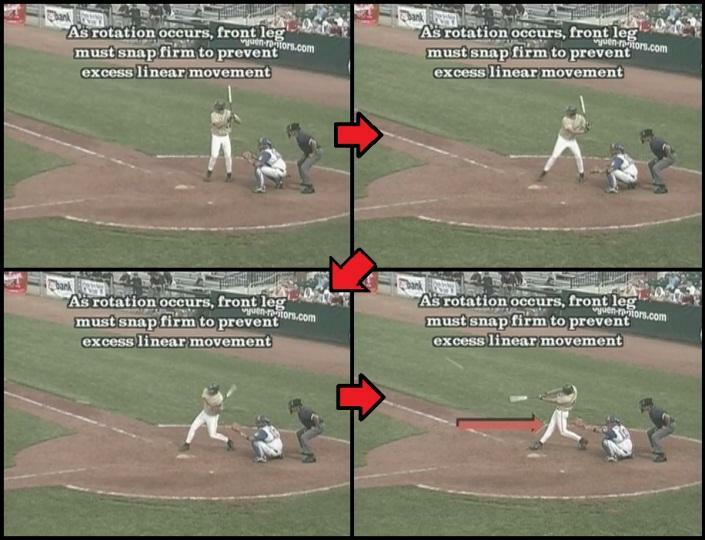 Be sure to share your baseball hitting questions and comments at the end of this article! In the photo below, the hitter is demonstrating a tap movement to start his lower half. He brings his front foot back, taps a couple times in about the middle of his body, in the middle of that stride, and then steps out. Again, he’s landing lightly on the inside part of his foot, moving to a solid base to provide balance and strength. His stride is short enough to provide that balance and strength, and long enough to fit his body type. It is a ball of foot to ball of foot movement where we are controlling the center of gravity with our head over our belly button. We must remember that a body in motion tends to stay in motion. And we want to build some energy into the swing. Again, the hitter must start early, work ball of foot to ball of foot, control his center of gravity, and keep his head over top of his belly button throughout the movement. Both the tapper, the kicker, and the strider have to determine when to begin their movement in relationship to where the pitcher is in his wind-up. The important thing to remember is the kicker must start earlier than a tapper and a tapper starts earlier than a strider. Upon front foot contact, next thing to remember with the swing is that the back heel comes off the ground aggressively and rotation will now begin in the swing. 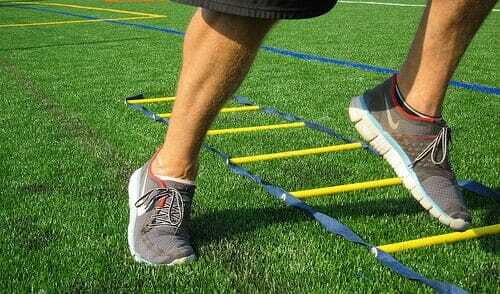 You’ll notice that as the back heel comes off, it begins to rotate and the power source begins to develop from the feet through the legs to the hips, then supplied to the torso and the upper body. We are now using the biggest muscles in our bodies to become involved in the swing. The biggest muscles in our bodies – through the legs, the torso, and the back area – will be the muscles that deliver the bat. This will give us the power source that we need to have a good, quick speedy swing. The power of the swing is generated from the back heel coming off the ground and rotating, starting with the lower half, from the feet, to the legs, to the hips, to the torso, to the shoulders, to the arms, into the hands that deliver the bat. Posture stabilization involves keeping the upper body, from the waist to the head, on the same plane from the hitting stance through the point of contact. This will aid in reducing head movement and helping to maximize power. 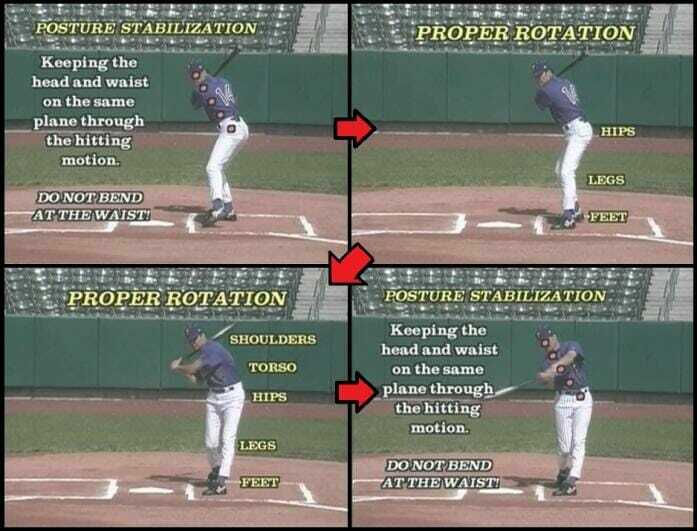 To maximize power, stabilize your posture from the hitting stance through the point of contact. Hitting the low pitch requires the hitter to drop or take the barrel of the bat to the ball as opposed to bending over at the waist. Bending over causes the player to lose balance, as his head moves away from his center of gravity. This action also causes a loss of power because the energy built up from the proper sequential movements of the lower body stops at the waist. A hitter who has a good sequential swing will deliver the bat with power. In this photo, the player is in the proper hitting position and he will be in a position of strength. He’s going to hold the bat so that it cannot be pushed back. You can see the position of strength that he has. A hitter who is out of sequence, who leads with his arms first, will now reach that hitting position but he has no strength at all and the bat is easily pushed back. To reach a position of strength and power, you need to have a sequential swing beginning with the lower half rotating before the upper half. 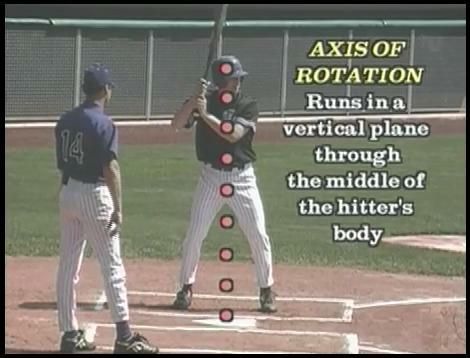 This hitter is demonstrating a swing that is out of sequence. If you’ll notice, the front shoulder is the first thing that is rotating. 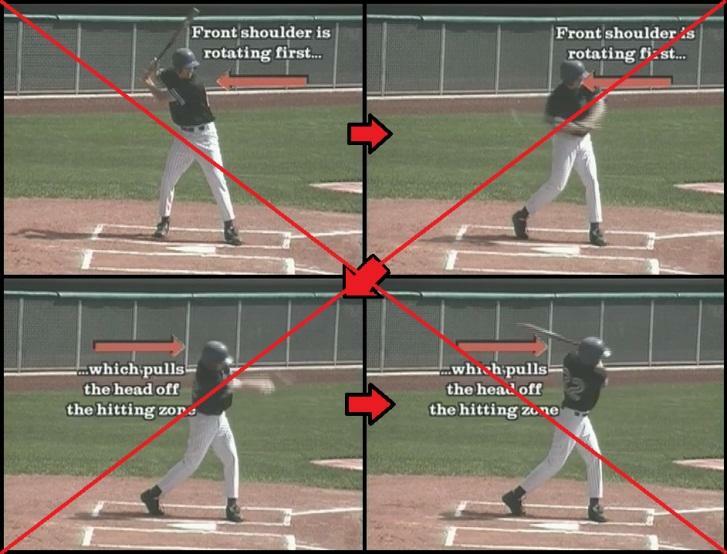 As the front shoulder rotates, it also pulls the head off of the hitting zone. 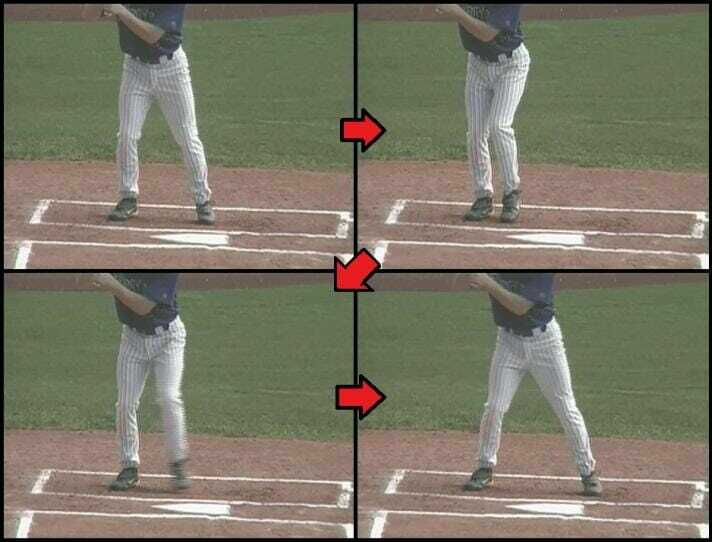 A swing that is out of sequence causes problems with rhythm and timing. It is also a less powerful swing and a longer swing. It disrupts the potential energy of the lower half of the body. The axis of rotation runs on a vertical plane right through the middle of the hitter’s body, and he will actually rotate around that axis in his swing. 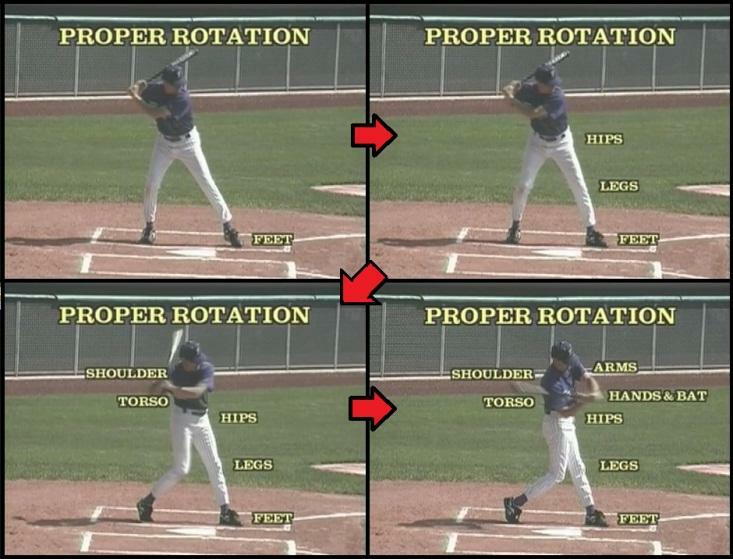 If you will notice, as that rotation takes places, that the last thing to come in the swing is the bat. This is known as bat lag. We will have the lower half of the body rotating first, the upper half of the body rotating last, and the very last thing to occur is bat lag in that swing. There are two types of movement when the lower half of the body begins its rotation. There is linear movement, which is the slight moving forward of weight, and then there is the rotational movement which we have already shown. 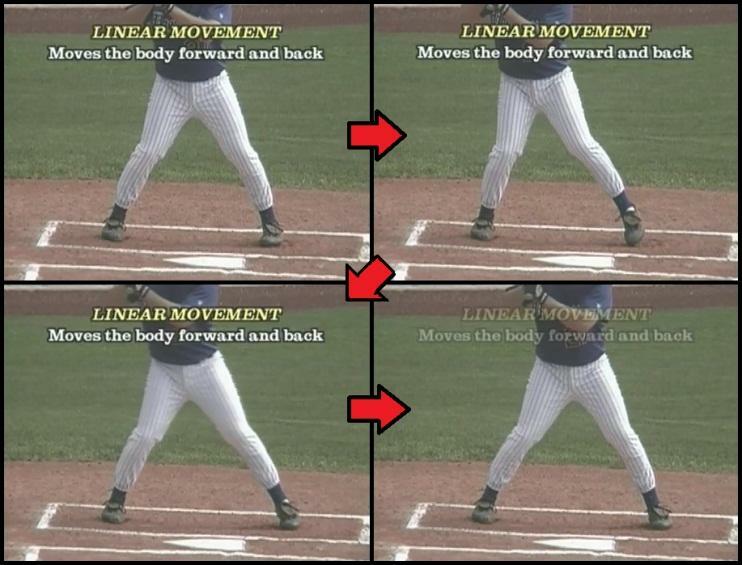 In order to stop a linear movement and keep our head still throughout the hitting sequence, it is very important as rotation begins to occur that the hitter’s front leg snaps firm, thus providing a firm front side for the hitter to hit off of. Our hitter will now demonstrate that firm front side. You can see that his firm leg that he is hitting against, that leg snaps straight as rotation begins. This stops linear movement and allows for the rotational movement to continue. Want more great baseball hitting drill ideas? Then check out “How To Teach Hitting Mechanics To Kids 7-14″. And don’t forget to Become a Fan on Facebook, where I will share more great baseball hitting drill tips and techniques!